Hovercraft Training Centers graduates don’t just learn to fly and then go back to their pre-hovercraft lives. We hear it over and over again: becoming a trained hovercraft pilot is a life-changing experience – bringing new adventures, new friends, and opening new horizons. Gary and "Neo" on the Colorado River, with the majestic Topock Gorge in the background. 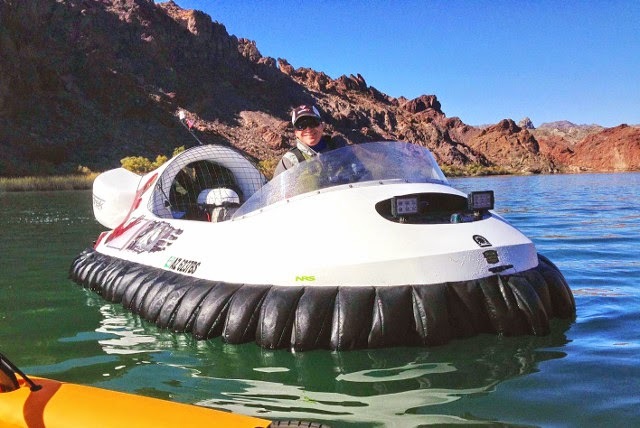 And now Gary is sharing his adventures, by organizing a brand new hovercraft event – the 1st Annual Havasu HoverFest, coming up April 10-12 in conjunction with the largest boat show in the West - the Lake Havasu Boat Show. 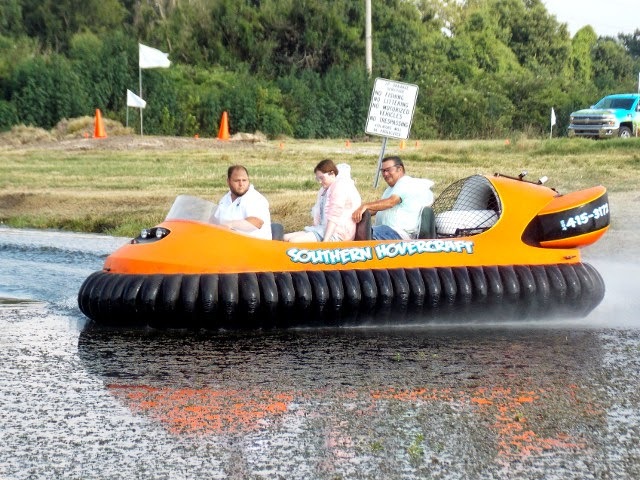 The HoverFest will include hovercraft demos, time trials off the beach, and a cruise up the Colorado River. 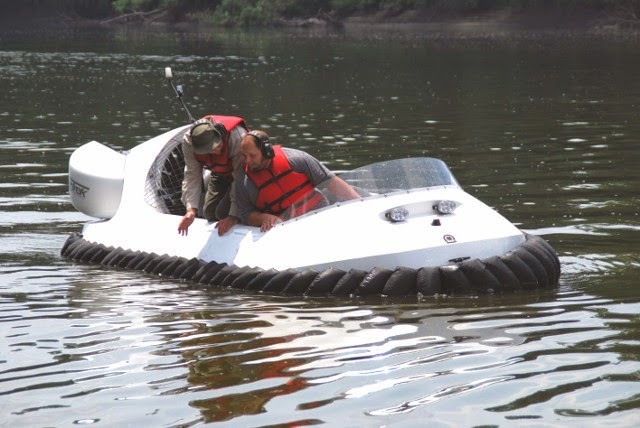 There’s a reason Hovercraft Training Centers trains exclusively on Neoteric hovercraft – the Neoteric HoverTrek™ is undisputedly the most innovative, effective and interesting hovercraft on the market. That’s why Bubba Watson chose Neoteric to manufacture his BW1 hovercraft golf cart – and chose HTC to teach him to fly it. Following on the heels of Bubba’s Hover, his world-famous viral video, Bubba is now ‘rapping’ his Christmas gift. He just released a new rap video, “Bubba Claus – The Single” – and after just a couple of days, it already has more than half a million views on YouTube. We at Hovercraft Training Centers use the analogy of hovercraft operation as a three-legged stool: If one leg is weak, it topples. The three legs are: 1) A properly engineered hovercraft; 2) Thorough pilot training; and 3) A comprehensive maintenance program. 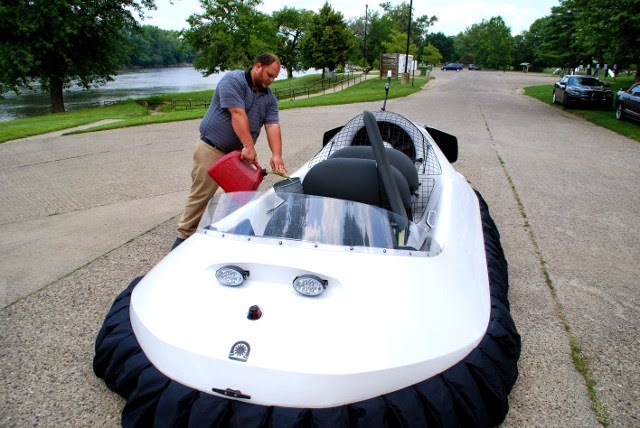 When you simply buy a hovercraft and take off on your own without pilot or maintenance training, most likely it’s going to end up parked in your garage and, whether you planned to use it for business or pleasure, your dream is going to topple. But when you make sure your intentions have a strong foundation, your future with your hovercraft will play out like Barry Eison’s – its novelty and usefulness will increase over time. Barry is a 58-year-old mechanical engineer from Tennessee, who bought a hovercraft a year ago, but first underwent training at HTC. 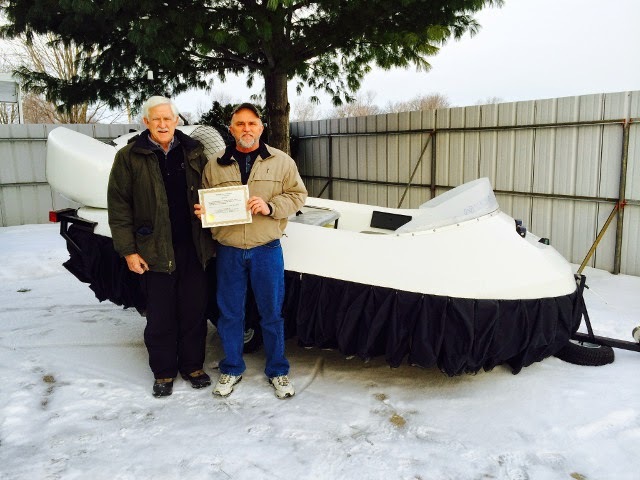 Barry Eison (right) receives his Hovercraft Pilot Certification from HTC Senior Instructor Chris Fizgerald. 2) A hovercraft is a flying machine. Its capabilities must be learned and it takes time to learn to operate it. 3) If one gets too “cocky” or arrogant in their familiarization with the craft, you can get hurt of damage the machine. 4) It’s important to learn to feel the response of the craft and recognize that it doesn’t take much to alter its flight. 5) Anticipate the path you will take when you’re executing turns or other maneuvers. 6) Think, think, think! Starting, stopping – every move requires thought until you know it by heart. 7) Don’t overreact when responding to changes. 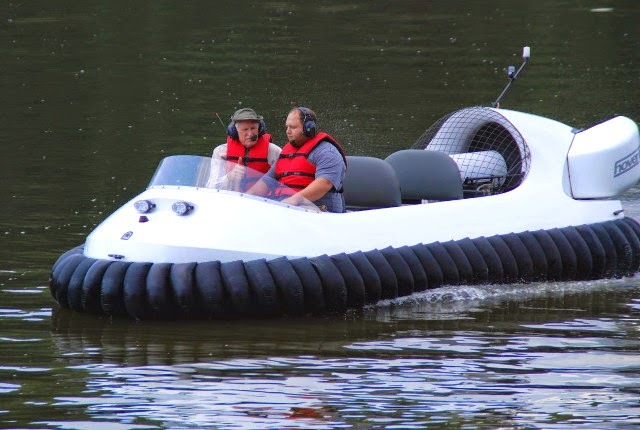 Thinking you might like to own a hovercraft? The first step to building a strong foundation is to see if a hovercraft is right for you. Early this year, Hovercraft Training Centers' Senior Instructor Chris Fitzgerald traveled to Hanoi to train first responders from Vietnam's National Department of Rescue & Relief, as well as personnel from Tuyet Nga Co. Ltd., a security and rescue equipment supplier. Tuyet Nga purchased two Neoteric rescue hovercraft for use by the National Department of Rescue & Relief - a great asset in a nation so often plagued by monsoons and floods. Shaw Couevas, a 27-year old from New Orleans, Louisiana, has the sense of adventure and the entrepreneurial spirit to make his dream come true - and then to make it profitable. But he also has the wisdom to make sure he knows what he’s doing – by taking the proper training. 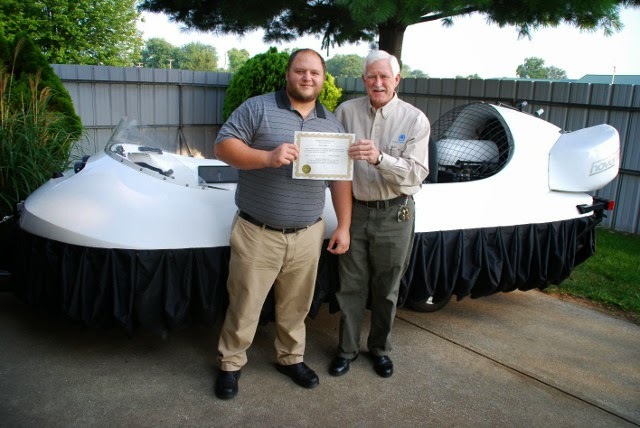 Shaw Couevas (left) receives his Hovercraft Pilot Certification from HTC Senior Instructor Chris Fitzgerald on the day he picked up his 6-passenger Neoteric HoverTrek™. Shaw’s story began when he was just a child. “When I was a small kid, I had a remote control hovercraft, and I was always trying to build one. So I’ve always known about them, but I never thought I’d use one,” he said. His first step was to find the right hovercraft. “I really didn’t know where to go when I decided to do it, so I went on the Internet. I called Neoteric because it seems to be the best on the market and because the Hoverclub of America recommended Neoteric,” he explained. Shaw is a “ready to go” kind of guy, who approached his training with enthusiasm. “I have a 700 hp 370Z, a 500 hp G37 Infiniti, a lifted F150 for mud, ATVs … give me an engine and a steering wheel and I’ll take it on!” he said. Better add rotors and rudders to that, because he's also a licensed helicopter pilot and boat captain! 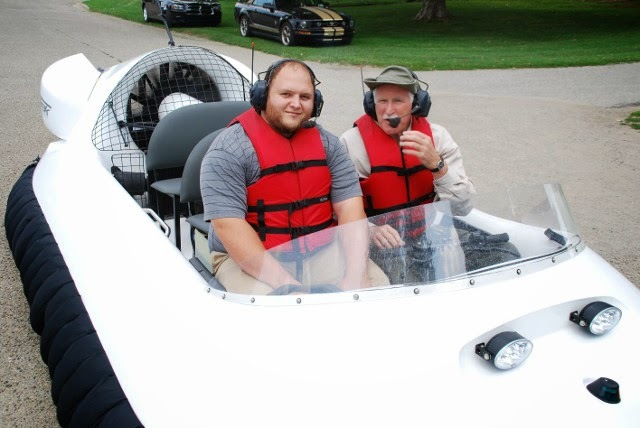 After a morning of classroom instruction, Shaw learns to conduct a preflight inspection and fuels his hovercraft for his first training flight session on the Wabash River. Wearing wireless headsets for continuous instruction, Shaw is all smiles as Instructor Chris Fitzgerald prepares to launch Shaw’s hovercraft. Chris Fitzgerald demonstrates the floating stability of the Neoteric HoverTrek™. Shaw gets a thumbs up from Chris Fitzgerald as he flies his hovercraft on his own. Take a Training Course at HTC!